Scots janitor was thought to be from Glasgow but the hit US show is about to reveal he hails from Kirkwall. One of the most popular supporting characters from the hit US TV show The Simpsons has been revealed as hailing from Kirkwall. 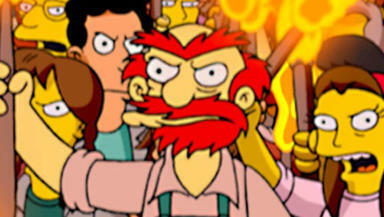 The Orkney origins of Groundskeeper Willie, Springfield Elementary's curmudgeonly janitor, will be divulged in an episode to be screened in the US later in February. In the episode, flame-haired Willie is shown as a young Orcadian born of a ‘Doonie’ father and an ‘Uppie’ mother in a family torn apart by the rivalry of The Ba’, the island's traditional festive football game. The revelations came in an interview with Simpsons writer Rob Lazebnik broadcast on Radio Orkney on Thursday morning where he discussed the episode, titled The Daughter also Rises. Following the announcement, Orkney MSP Liam McArthur has called on Glasgow City Council to remove the character's name from its website, where it is claimed Willie – whose full name is William MacDougal - is a famous Glaswegian. Mr McArthur said: “We know that those with Orkney roots are to be found far and wide across the globe. It should come as no surprise then that the Orkney diaspora has even reached Springfield USA. “I was concerned to note, however, that Glasgow City Council have made moves to claim Groundskeeper Willie as one of their own by listing him as an 'alleged' son of their city. "In light of recent, incontrovertible evidence and to avoid any future confusion, I have written to the Leader of Glasgow City Council, requesting that they renounce the claim on their website, and in any other relevant materials. A spokesman for Glasgow City Council said: "We're confused because Willie has previously described himself as being the ugliest man in Glasgow. "Perhaps he is from Orkney, but like everyone else in the world who's not Glaswegian, he just wishes he was. We've changed our website to reflect his new claim." Groundskeeper Willie first appeared in the second series of the hit animated series in a 1991 episode called Principal Charming. Voiced by Dan Castellaneta, who also voices Homer Simpson, Willie has been called 'the most recognisable Scot in the world' by The Times newspaper. Willie's origins have always been shrouded in mystery, although he was revealed to be a fan of Aberdeen FC in a 2003 episode.